The risk of fire in office buildings is substantial enough to warrant implementing the maximum amount of fire protection safeguards throughout these structures. According to data published by the U.K. government, there were a total of 15,984 fires in non-residential buildings during 2015 in England and a staggering 11,564 of them were accidental. High-rise buildings such as offices are particularly dangerous locations for fires to occur. Blazes can spread swiftly between floors, and the increased elevation at higher floors makes it difficult for fire-fighters to extinguish flames there. Aside from the obvious risks to human life associated with an office fire, there are significant business risks too, including the loss of important documents or the financial effects of a temporary business shutdown. Comprehensive fire protection begins with the initial design of offices and other commercial buildings. The following protective passive design measures should be utilized when constructing the building to maximize the fire safety of that structure. 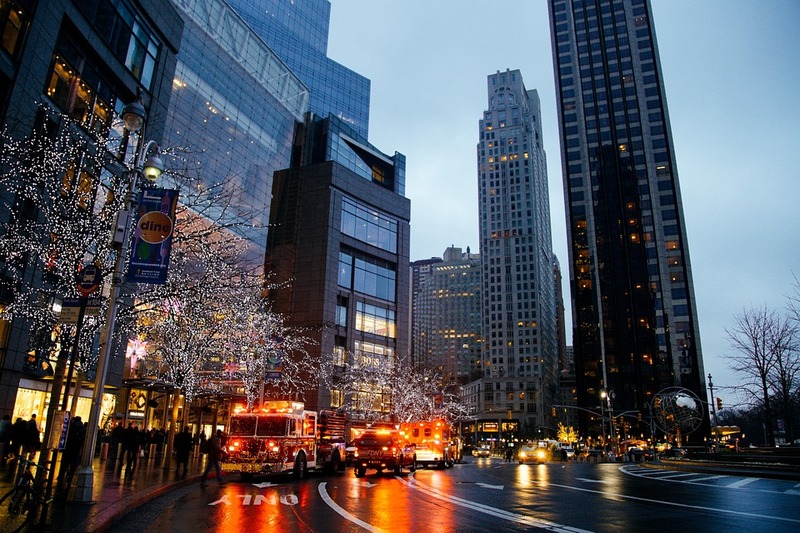 Fire resistant glass technology has progressed rapidly over recent years, and the installation of high-performance fire protection glass throughout an office building is one solution that markedly improves the structure’s fire safety. Fire protective glass works by minimizing the spread of flames and smoke throughout a building. The fire safety glass has been specifically designed to withstand higher temperatures than standard glazing, and for a longer duration. The crux of this is that office fires can be isolated to one area, helping occupants of the building to escape and allowing fire-fighters to bring the blaze under control. Modern office buildings should be designed with fire resistant glass partitions and doors as a primary protective measure against fires in the workplace. Water-mist fire suppression systems are becoming increasingly popular in commercial buildings such as offices as an effective fire protection solution. Water-mist systems work by spraying very fine droplets of water at high pressure over flames, which cools the fire and removes oxygen from it, thereby suppressing two of the three elements necessary for a fire to occur. Steelwork should not be used in the construction of a building unless appropriate action is taken to increase its fire resistance. The inherent fire resistance of steel is often poor, with sections offering between 12 to 50 minutes of resistance until failure, depending on the temperature profile and the load of the steel. Additional measures need to be taken during the design phase of a building to adequately fireproof steelwork so that it becomes more fire-resistant. Intumescent paint must be used by law on all steelwork, but the layers of coating required to meet legislative requirements can add significant costs to the construction of a building because it often needs to be applied on-site to the steelwork to avoid damage during transportation. A feasible solution is to leverage new technologies such as the next generation of intumescent paints that use nano-materials to make the paint more durable, thus allowing it to be applied off-site to any steelwork. Specially manufactured fire doors offer another layer of protection against the spread of fires throughout an office building. Fire resistant glass doors offer a solution that is both efficacious in preventing the spread of fire in the workplace and aesthetically pleasing. Other interior fire door solutions for commercial buildings include wooden doors that have been fireproofed with in-tumescent paint, or steel fire doors. Taking the necessary steps to ensure that walls are fire resistant is another vital component of effective passive fire protection. Fire-resistant walls help to contain and control the spread of flames throughout office buildings, which minimizes the possible damage from fires. Drywall partitions should be used to improve the fire-resistance of interior walls, alongside other non-combustible building materials such as fire-resistant concrete masonry. Integrating such fire protective materials into the initial construction of an office space ensures that both existing and future safety needs are met, as well as future changes in compliance regulations. Property owners will also enjoy significant cost savings in the long run as eventually the likelihood is that in the future compliance regulations will become even more stringent and specifically require the installation of these specific fire protective measures. Speak to our specialist Stephen for full details on our range of Security Glass.